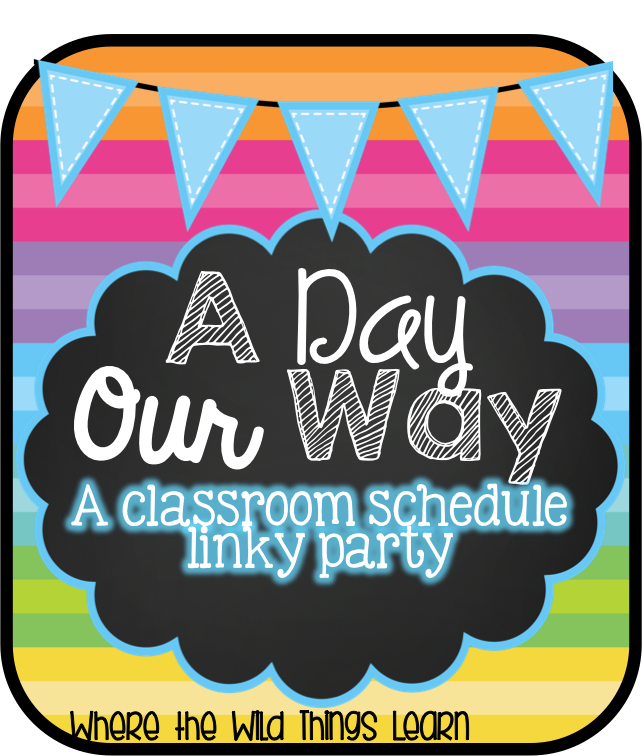 Today I'm linking up with Amelia from Where the Wild Things Learn for her A Day Our Way - A Schedule Linky! 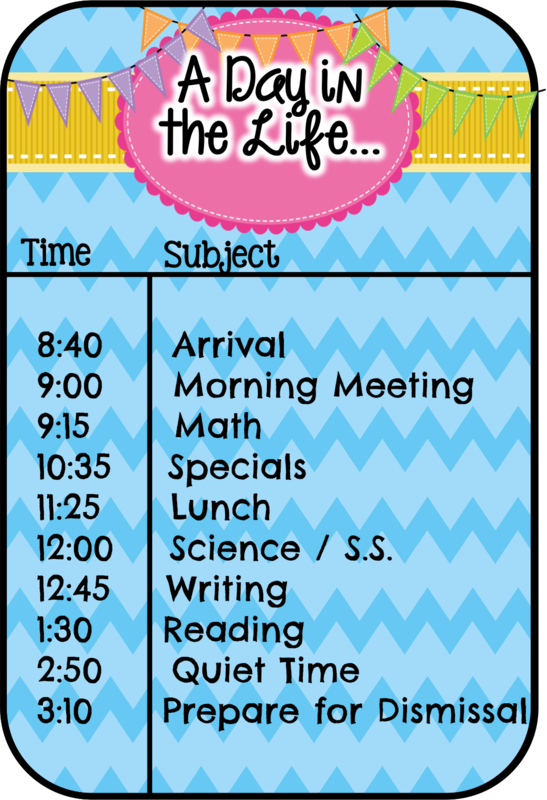 Here is a copy of what our daily schedule usually looks like in fourth grade. Students go to breakfast, stop at their lockers to drop off their backpacks, and arrive in our room. The first thing they see upon entering is our interactive morning message. They read the message, respond at the bottom with a post-it note, and proceed to their desk. Once they sit down they copy their homework into their planner, place the planner on the table to be checked, and begin their morning work. Our morning work usually consists of a math word problem. You can check out my math word problems here. Once their morning work is complete they bring it to the carpet, along with a marker/pen and clipboard and sit in a circle while they wait for announcements to begin. Around 9:00 our morning announcements show on our Smart Board. Our school is lucky enough to have the technology available to produce morning announcements that can be viewed on our Smart Board or on the TV. Once announcements are over we begin our morning meeting. We follow a responsive classroom approach. Morning meeting consists of a greeting, a quick activity (and we go over our morning work), sharing, and discussing our morning message. For math we use Engage NY's math modules. The modules take forever to get through so you really have to be strategic as to which parts of it you want to teach. Our school requires us to meet all the components of each lesson. However, I pick and choose which examples I think are most important for students. I often move part of the fluency to be practiced in-between specials and lunch since we have an awkward 10 minutes to kill then. After completion of the daily module lesson we record what we've learned in our interactive math notebooks. 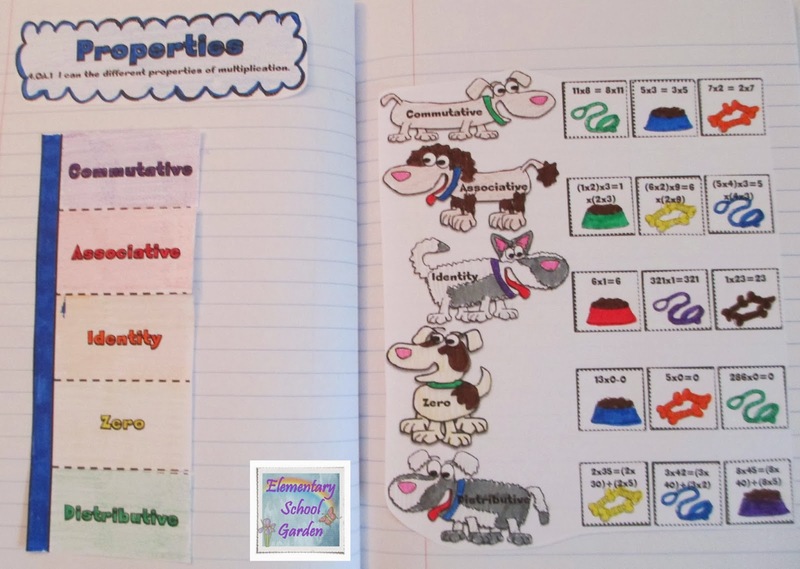 You can purchase a copy of our interactive math notebooks here in my TPT store. Then students begin math centers. This provides me the opportunity to meet with a needs group or two. 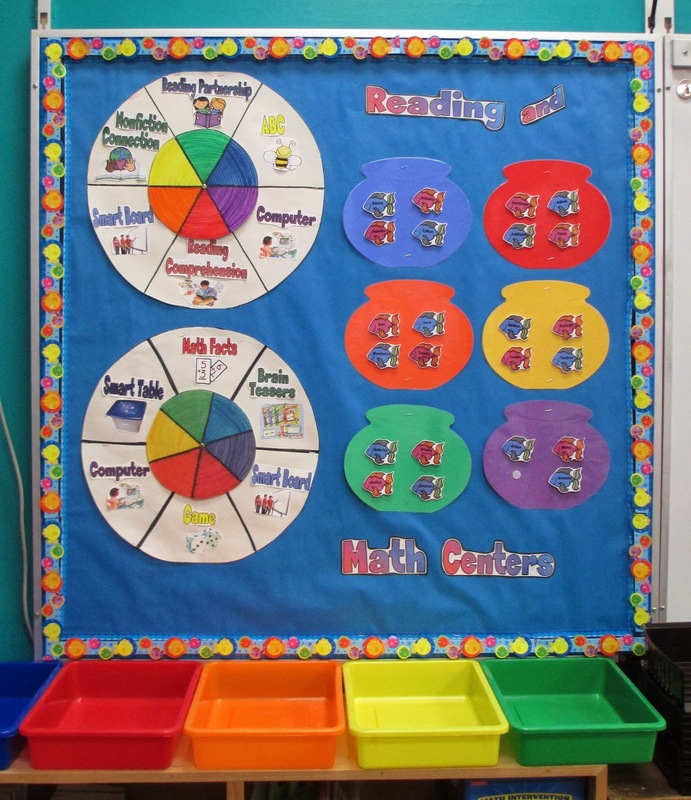 I use a center wheel for both math and reading centers. More to come on reading if you scroll further down. Around this time our specials usually begin. Our specials (P.E., Music, Art, Library, and Computer Lab) change daily which impacts our schedule. However, we have a similar schedule day to day. I alternate science (3 days a week) and social studies (2 days a week). Our district has created our own curriculum for most subjects. However, I am slowly starting to create new lessons and activities for each subject, like my pack for the Iroquois. We use writer's notebooks in class to record knowledge learned during lessons, to create topic lists of ideas, and to free write. Our district also has certain genres that they'd like us to focus on (such as slice of life, narratives, research reports, poetry, etc...) as well as WAR (Writing About Reading) pieces that are collected and assessed each marking period. Our reading block starts with a read aloud and mini-lesson. Occasionally we work on our interactive notebooks for reading. Afterwards students reading independently, work on WAR responses, and then move on to their center for the day using our center wheel. We often meet back together at the end of our reading block to share our independent reading books and/or our writing with each other. The last 20 minutes of the day are spent catching up on unfinished work, beginning homework assignments, practicing spelling words, or playing a quiet game. This time is vital for me. 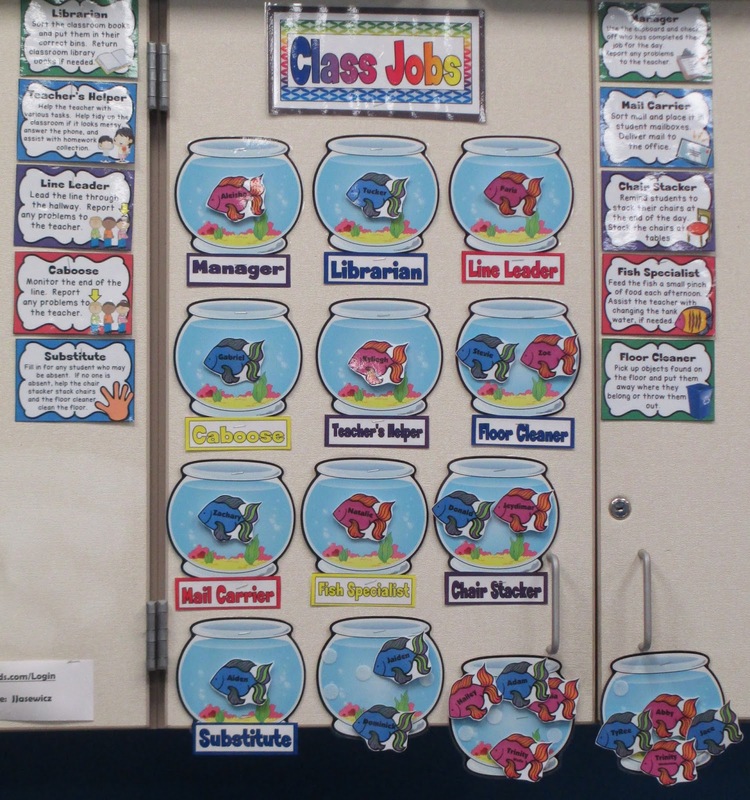 I can pull students 1:1 or in small groups to work on various skills that I have trouble reaching throughout the day. At the end of the day students get their mail, stack their chairs, go to their lockers, and complete their weekly jobs. I love your morning meeting time! It is so nice that you fit that in each day! I also love that you take time to share your independent reading and writing with each other. I'm sure the kiddos love that!